The organization is formed by disintegrating people and members of youth gangs. In Mexico there are many juvenile crime groups that are engaged in drug trafficking. 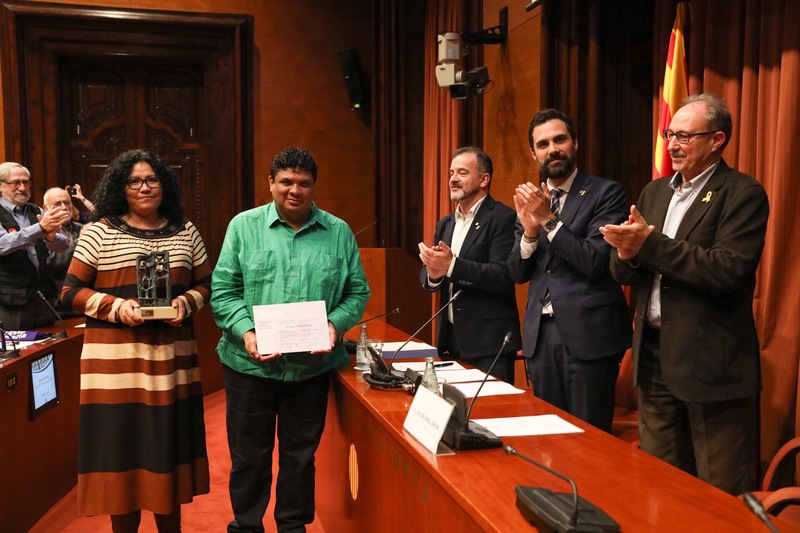 Carlos Cruz and Erika Llanos at the delivery of the ICIP Prize 2018 Peacebuilders. Youth street bands are a reality in many countries around the world and in Mexico, specifically, they are a phenomenon that is due to economic needs and that causes the youth population to end up involved in environments of violence and drug trafficking. Cauce Ciudadano was born 19 years ago with the aim of preventing, reducing and eliminating this climate of crime. Unlike other organizations, the founding people of Cauce Ciudadano come from the bands and, at the time, were generating juvenile violence in Mexico in the 90s. At that time, after several clashes, the murder of an integral member of one of the bands took place. As a result, this organization founded by Carlos Cruz, companion of the murdered person is created. According to the director of Cauce Ciudadano, Erika Llanos, educator and first woman not a member of the band, the engine that moved the entity was this motto: "Never again a young man in prison, never again youth people at the hospital or the cemetery. "We raised the importance of dismantling the social base of organized juvenile delinquency. The idea of ​​Cauce Ciudadano was to reconvert the people of these bands into positive units, agents of peace and social change, explains Llanos. Add: "Who better to work with bands than former bands". At the moment, Cauce Ciudadano focuses on educational and community work at school centers, public spaces, youth interns and penitentiary centers in order to train young people as agents of change. Since its inception, Cauce Ciudadano has invested more than 260 thousand people and has worked with more than 832 entities from 126 municipalities in the country. According to Llanos, the organization is currently also working in two provinces of Argentina, Santa Fe and Rosario. "We have designed a model for the prevention of violence based on four axes of action: from a human rights perspective, promotion of health, attention to the damage caused and rehabilitation," says the director. One of its leading projects is 'Ciudad Retoño' that brings together relatives of victims of disappearances and groups and civil society organizations. The initiative aims to develop comprehensive strategies aimed at peacebuilding. As part of this project, Llanos says, community interventions have been conducted aimed at a thousand children and young people from communities affected by organized crime. The trajectory of Cauce Ciudadano has been recognized by the 'Institut Català per a la Pau' (ICIP). Llanos emphasizes the need to listen to reverse the climate of violence and crime in Mexico with the idea of ​​organizing in the social field and creating "peace economies."